One of the biggest deterrents from getting dental implants is the patient’s fear of pain and discomfort afforded by the lengthy process of installing them. Long surgeries involving invasive probing, extra recovery time because of incisions, and trepidations over possible results weigh heavy on the mind of potential patients, oftentimes causing them to put off coming into our offices even in cases of emergency dental needs. This fear is cause for concern in the dentistry world because left untreated, the loss of teeth can have a long-lasting impact on the qualities of lives of our patients. Not only do missing teeth cause bone atrophy, but they can also lead to a slew of other oral problems like an increased susceptibility to gum disease and cavities. Fortunately, thanks to the latest innovations in dental imaging technology, our Midtown dentists are able to more accurately plan your procedure, eliminating the need for painful incisions and providing a clear view of the process involved and your resulting new smile! 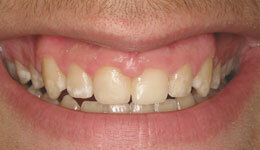 What are Incisionless Dental Implants? 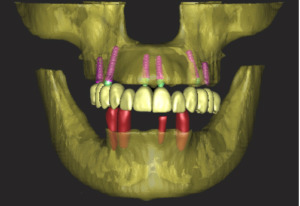 When a patient is missing a tooth, several teeth, or all of their teeth and oral health supports an ideal environment for dental implant placement (adequate quantity and quality of bone and gum tissue present), we can use our state-of-the-art technologies like Cone Beam Computerized Tomography (CBCT) to produce a 3-D image of your mouth. This scan is then used alongside specialized software to plan out your implant placement with pinpoint precision — all before you even sit in the chair! These plans help us to accurately create a customized surgical guide for placement of your dental implants, without the need for traditional sutures and incisions required to complete the implant! What’s more, with 3-D planning, your prosthesis will be crafted and the dental implant placement will be planned before your visit, making the actual visit faster, less invasive and more comfortable. 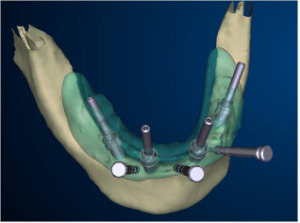 Dental implant placement utilizing computer-guided software is a minimally invasive procedure, which means we preserve as much bone and gum tissue as possible. In the long run, this has been proven to be more effective for tooth support, healing, and aesthetics. 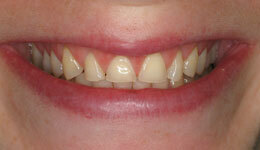 Best yet, there is significantly less (and often no) discomfort during and after the procedure! Using the computer-guided, minimally invasive Smile in a Day™ treatment with All-on-4™ implants, we were able to help this man (F.F., for confidentiality purposes) get back to his life and smiling with pride! 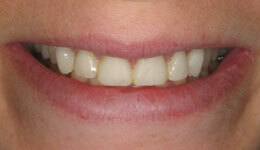 “I was told I needed bone grafting. I didn’t want to wait that long. The procedure was quick and painless. I was asleep and didn’t feel a thing before, during or after! I can’t even tell that these aren’t my own teeth. I would recommend this procedure to anyone! Dr. Nejat and his staff are very professional and caring.” -F.F. 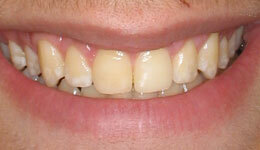 Unhappy with his partial dentures (absent in the first photo), this patient requested non-removable teeth. Other dentists previously told him he didn’t qualify for dental implants because of bone atrophy and a low sinus density, which would require extensive grafting. Fortunately for him, we were able to use SimPlant and Nobelguide softwares to come up with a computer-guided 3D plan. This allowed us to extract his decayed remaining teeth and place 6 implants, with the distal ones angled away from his sinuses, which provided support for a natural looking 12-tooth bridge. We performed the entire procedure with as little pain as possible — all on the same day! Don’t Hesitate, Request a Consultation Today! Let your fears of painful implant procedures be a thing of the past with our all new dental imaging and implant systems. If you suffer from the loss of one, multiple, or all of your teeth, you no longer have to be afraid of lengthy, painful procedures. Call our Manhattan cosmetic dentist office at (212) 581-1091 to request your implant consultation with one of our Ivy League trained implant dentists today and leave with a brand new smile right after your next appointment!